Its not everyday that you come across a comparison between dabbas. No, don’t get me wrong. By dabbas, I mean the vans roaming across in India. Not that there are too many choices but then for the economy spectrum, it would be the Maruti Omni, Maruti Eeco and the Tata Venture in India. I remember having test driven both the Maruti Eeco and Tata Venture but then the Omni was something which I am yet to touch upon. Since no one has tried comparing these 3 before, we at Indiandrives decided to take the onus upon ourselves. Getting the three cars especially the Maruti ones wasn’t a problem but then since the Venture was also launched across India recently, it wasn’t a problem with it either. The Tata Venture is something as a new phenomenon in this segment as also the Maruti Eeco. The Maruti Omni has been relegated to oblivion and rarely do I see a new Omni on the roads nowadays. Just like when the Alto came in, sales for the Maruti 800 diminished. Cut to the chase and here is the comparo between the three that happened. 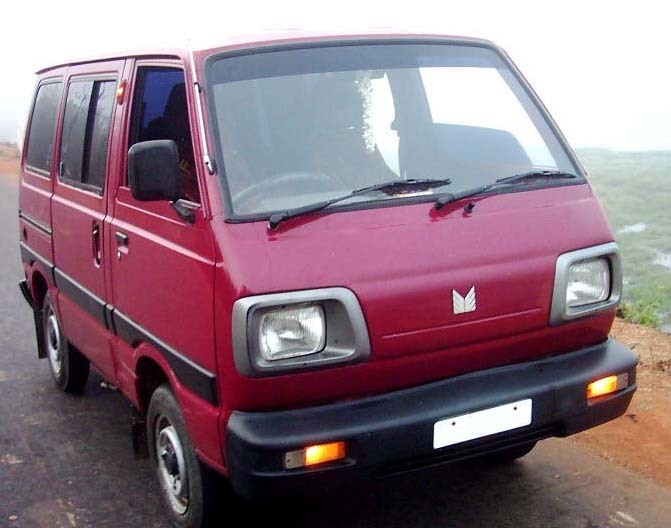 Maruti Omni – The Maruti Omni in India has been carrying on virtually unchanged from the time it made into production. It has got some cosmetic changes over the year and a BS3 compliant engine. The head lamps are now clear lens unit but with black plastic surrounds beside them. The front bumpers have the turn indicators embedded in them. The side profile in the meanwhile shows of the tyre size 145 R12. Been fitted with radials enables it to have some sort of grip on the road. There are sleek body graphics to paint a new picture of this aging van. The rear has that large windscreen and tail lamps which are also now of the clear lens variety. The hatch is the upwards opening one. Maruti Eeco – Old wine in an old bottle is what one would call the Maruti Eeco in India. It looks exactly like the Maruti Versa, same for some new graphics. On closer observation, one would find the slightly reworked upon nose section. In keeping with the times, it has been also given a bigger bumper and bigger 13 inch tyres. The tyres are radial as well. The body also gets some jazzy graphics like the Maruti Omni. The upward opening hatch has vertically stacked tail lamps, of the clear lens types. The common thing in both the Eeco and Omni are that they have black bumpers and side view mirrors. Tata Venture- Would I call the Tata Venture a cut above the rest? I would think twice before saying that. But then on third thoughts, it may be. 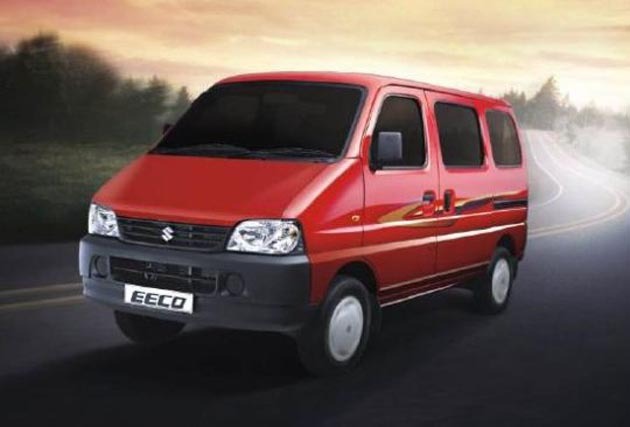 It more of a rectangular van suiting the name of a van to the T. Move over Omni and Eeco, you have got far many curves. But then the Tata Venture in India looks like a more upmarket version of the Maruti Eeco. It has got body colored side mirrors, a chrome grille in the front. At the cost of repeating myself, it has got the Christmas tree tail lamps effect. A chrome bar at the rear for opening the tail gate also does wonders to the overall design. Lest I forget, the tyre size is 165 R 14 LT 8 PR. I would give it to the Eeco though it is like asking me to choose between Pepsi and Coca Cola. Maruti Omni – There are two variants of the Maruti Omni available namely the 5 seater and the 8 seater one. The two tone upholstery is a welcome change from the earlier all grey one. The steering wheel is one of the oldest units from the Maruti stables. The meters are also basic. Unlike the earlier build quality of Marutis where you find number of wires dangling from everywhere, the new Maruti Omni has somewhat better construction. There are many cubby holes in and around the cabin. The steering wheel is adjustable for reach. The 5 seater version gets front facing seats whereas the 8 seater ones get opposite facing seats. If you are an individual looking forward to seating your family in some comfort, I would bet my money on the 5 seater version. The 8 seater is better avoided as it becomes too cramped. The luggage space is also better in the 5 seater version. The doors are of the sliding type in all the three cars and so there is not much difference. Maruti Eeco – A step up from the bare bones Maruti Omni is the Maruti Eeco in India. It gets a better build quality than the Omni. One can be assured of a towering view from the seats of the car. There is no power steering even on this vehicle and the steering wheel unit looks similar to the one in the Omni. But then the meter dials look better finished here. It has got the all essential AC in there. Colling is not exactly to ones liking but then it is an economical car and we shouldn’t be complaining much about this. Now for the Eeco, I would suggest that you go for the 7 seater variant. It has got better seating for 7 and I am sure that even the biggies wouldn’t mind sitting at the rearmost seat. Luggage space does get compromised due to the seating arrangement. Tata Venture – The new kid on the block. Well step into the interiors and you would notice that this van is in a league of its own. It has got a 3 spoke steering wheel and a two tone dash. There is even a tachometer. There is a pop open glove box as also a lockable one. Our test car came with a factory fitted music system. Refreshing after spending time in the cabins of the Marutis. Space is okay for a car which measure just under the 4 meters mark. The last row of seats is a tad too tight than the Maruti Eeco. But then the storage space is more than the Eeco here. The boot can easily fit in 2 suitcases even with a full complement of passengers. There are front power windows as well on this car, a luxury which the others in this comparo miss out on. Build quality is better than the Marutis for sure. Any doubts on this one? It is the Tata Venture for sure. Maruti Omni – The Maruti Omni boasts of the smallest turning circle in this comparo. It stands at 4.1 meters. This makes it nimble and agile in city speeds. Out on the highway, the nervous steering doesn’t cut mustard for a good driving experience. The Leaf springs with Shock absorbers at the rear and McPherson Struts in the front do present a choppy ride quality but then the expected clientele (read the rural populace wouldn’t so much as mind it). The handling is something which you wouldn’t expect from a bare bones car but then it is better than one’s expectations. NVH is on the higher side due to the engine been under the front seats. The thin wall construction also means that more of the road noise percolates into the cabin. Maruti Eeco – The Maruti Eeco like I have always maintained, is a step above that of the Maruti Omni. It also handles similar to the Maruti Omni but then the turning radius is a bit more than that of the Omni. It rides well but then for achieving that ride quality, one has to carry around a full load of passengers. Be the only one driving the car and it would pitch and dive at every urgent braking maneuver. Handling is something which tall boys aren’t designed for and the Eeco amply demonstrates it. Though it is still a nervous handler with the crosswinds buffeting it around, it doesn’t get out of hands. NVH is better damped than the Omni but then you always have a feeling that there is a motor lurking beneath your seat. 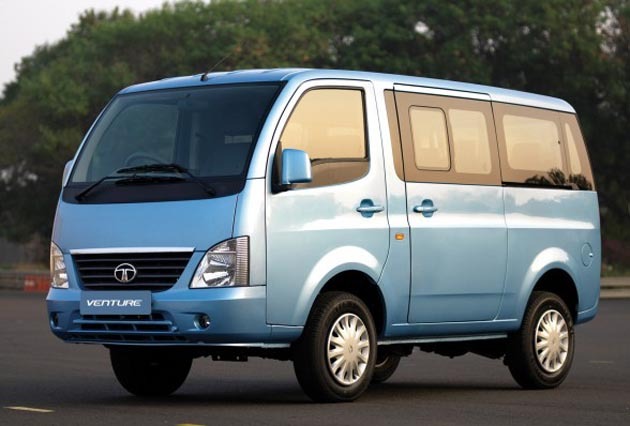 Tata Venture – Typical with all the Tatas, this one also presents a good ride quality. Even so with just a driver onboard or even with full 8 seats occupied. It gets a power steering unit which is precise and nimble at city speeds but then weighs up nicely while on the highway. Mention must be made of the awkwardly placed clutch pedal which is very close to the gear lever column. Handling is lost somewhere in the bargain. The Eeco definitely bests it on the handling front.NVH is better than both the Eeco and Omni with the van displaying an amazing eeriness. Turning radius is also similar to the Eeco. The Tata Venture wins this round solely on the fact that it has got a better ride quality and somewhat direct steering wheel. Maruti Omni – The Maruti Omni carries the 3 pot motor from the Maruti 800. It is a 786 cc motor which displaces 38 Ps @ 5000 rpm and torque of 6.1 kgm @ 3000 rpm. It is mated to a 5 speed manual unit. The gear shifts aren’t up to the mark as they feel somewhat vague in nature. While I couldn’t check the 0-100 kmph run due to a faulty checking equipment, estimates would place it around the 20 seconds mark. The top speed was 126 kmph. Brakes are discs at front and drums at rear. Go all out for it and the car would easily break traction and move somewhat sideways. Nerve tickling! You bet. It doesn’t get any other electronic aids for braking assistance. One of the main reasons why the Eeco was launched is due to the fact that the Omni lacked safety features. Side impact beams and 3 point seat belts are the only talking features. Fuel efficiency though is of high order from the 3 cylinder motor. It gives 13.4 kmpl in the city and 20.7 kmpl on the highway. It is also available with a LPG variant. Maruti Eeco – The Maruti Eeco is offered with a single engine option and it is the 1.2 liter 4 cylinder motor putting 73 Bhp at 6,000 rpm and 101 Nm of peak torque at 3000 rpm. It is mated to a 5 speed manual transmission. Expect 0-100 kmph runs somewhere close to 17 seconds. The top speed is in the regions of 142 kmph. The engine is smooth and vibe free. Due to the high torque, driveability is also very good in the city and the van can easily stretch its legs on the highway as well. It is also available with a CNG option. But then the torque seems slightly less when there is a full load of passengers. Brakes are the usual discs at front and drums at rear. Nothing acting as braking aid here as well. Safety part is a bit better than the Omni with a protrusion of an excuse for the front bumper, collapsible steering column, side impact beams and 3 point seat belts for all the passengers. Fuel efficiency is as good as any Maruti small car with the Eeco returning 13.1 kmpl in city and 19.4 kmpl on the highway. Tata Venture – The Tata Venture is offered with a choice of 2 diesel engines. The engine is the same 1.4 liter unit found in the Tata Indica but in different states of tune. The BS3 version makes 50 Ps of power whereas the BS4 version makes 71 Ps of power. Torque for the BS4 version is also in the range of 135 Nm. Both the engines are mated to 5 speed manuals. The gear lever, unlike other Tata offerings had a positive action. Top speed is also in the region of 130 kmph. Due to the virtue of it been a diesel, the lower down poke is something which can be applauded. The driveability factor is better than the petrol units. NVH is nicely damped for a Tata motor and infact it is better than the petrol units from Maruti. Brakes are the industry norm of discs at the front and drums at the rear. But then the braking feel was a bit too wooden. Safety is top notch for van with reverse parking sensors, engine immobilizer, side impact protection Beam and shield lock, collapsible steering column and Front Crash Reinforcement. Fuel efficiency is excellent with 13.2 kmpl in city and 21.4 kmpl on the highway. This too in a diesel. Wonderful. Tata Venture wins this round due to the sheer virtue of it been a diesel and having some good safety features. I think the contest should have been between the Maruti Eeco in India and the Tata Venture in India but then the Omni been a strategic workhorse for the company since long, was pushed into this comparo. Now, in almost all of the tests, the Tata Venture aced (no pun intended) the others. So no questions about it, the Tata Venture is the winner of this comparo and by a significant margin. But going by the price quotient, the Maruti Omni in India would be a winner. Maruti Omni price in India starts from Rs 1,98,754 – Rs 3,02,228 ( ex-show room, Mumbai). The Maruti Eeco price in India starts from Rs 2,73,397 for the base 5 seater variant and upto Rs 3,63,962 for the 7 seater CNG version , ex-show room, Mumbai. The Tata Venture price in India starts from Rs 4,10,000 and goes upto Rs 5,23,000 ( ex-show room, Mumbai). Factor in the running costs of diesel and the Tata Venture makes more sense than the Marutis. Even Tata has a widespread service network in regards to the Maruti one. Tata Venture is a wonderful car. First of all-hats of to you-you are the ONLY auto-journalist to do a fairly detailed test drive of the Venture and then your superb comparison of the Venture,the omni and Eeco. 2. Why has tata not advertised this product much? ( Just like the Magic -IRIS)-hope they don’t find that like the Nano,advertising the strengths of the product are ESSENTIAL?? Thank you for the compliments. Tata Venture does have discs in the front and drums at the rear. Not sure of Tata’s marketing strategy though regarding the Tata Venture. Even we at Indiandrives are shocked to see that Tata aren’t promoting the Tata Venture much. It may be that they want the car to sell through word-of-mouth publicity. The Venture is targeted more towards the economy class whereas the Winger is a slightly more upmarket version of it. The Tata Venture GX would be a best buy but it would depend on your preferences. If you prefer to carry around more passengers, then the Winger would be the one to go for. @Ashir Yes, it is very effective. kwel i am planning to purchase tata venture,i have been collecting reviews as well as information about venture..i am confuse becoz venture has launched just before 2 months and i never seen venture roaming on the road but that car just sticked to my mind and heart this much i liked it so should i wait for more 2-3 months or should i go for booking? You can book the Venture after going for a test drive. In this manner, you would know whether the car fits you or not. It has got an utilitarian image and the Tata brand image doesn’t spruce up things either. This may be the reason why not many Ventures can be seen roaming the streets. Also we haven’t seen many Ventures roaming around. As for the wait part, you can check with another dealer if he is ready to offer you a model at the earliest. Engine and internals would be as reliable as any other Tata car in India. TATA motors is the Microsoft of India. Windows OS crashes every 1000 hours and TATA cars blow up in flames every 1000 kms after their launch of a new product. Its a new model launched mid Feb so they must be tweaking it from blowing up. Stop using pirated copy of Microsoft and then complain about it stability. I am Microsoft developer from last 7 years and have found that it is one of the stable and user freindly OS. Yes but use genioun copy !! We have four Eeco brought at Guwahati, Assam. Out of four vehicle three vehicle are facing extreme front tyre heating and alienment problem within 1OOO KM . Within this period we have to change Six tyre of these vehicle even after checking “alienment” regularly.One of vehicle have excess sound from the rear side – Axcle . We are attending dealer service centre many times but no possitive result found. Another problem short of spare part in Guwahti. At the time of purchase ; we feel proud to be the owner of four Eeco vehicle but at present we have to hide from other customer enquery. Will company look after these problem of our vehicle and the coming new vehicle. Your venture description is very well, but the price is little more because the middle class couldn’t hold it. but in overall view i like it very much. I think it is more economy than Eeco because of diesel engine. i would like to know about the engine which is right next to the seat. it should be heating up and providing discomfort, affecting the AC cooling. No such issues noted with the engine and the cooling. If some parts / section which created problem will modified / replaced / developed and it will give more comfort and painless journey.Also the mechanic of all the dealer should be trained to traceout the problem and available all the spare then Eeco will best verson of middle class family. Hi Lijo I really appreciate you efforts in bringing such a good post but one thing keeps buzzing me is how do you compare an MUV from segment A to one in segment B. According to my knowledege Omni and Ecco can never be compared. Even though both the cars are from different segments, there is less price difference between both and most of the times, if you go to a show room, the sales person would definitely try to convince you to go for a higher up model. This comparison was to clear the differnce in the entire traits of the two cars. I really think the Venture is a good product conceived by Tata catering to this particular segment.However it remains to be seen how glitch free this product will be initially and in the long run. Tata can win hands down if they introduce more modern engines like the Fiat’s Multi-get and pose a threat to other more accomplished manufacturers like Maruti and Mahindra in MUV segments. The engine in the Venture is closer to the one in the Indica and NVH levels are lower than what one would expect from a Tata vehicle. i have maruti Omani and eeco (cng) company fitted kit,omani is also a good but eeco have powerful ride on highway eeco have normal speed like 90 to 110 on cng with a/c.there is no vibration heating in car. but fuel effeince is to bad in one cylinder of gas can run only 90 km with a/c without a/c run 110km. I have Tata venture. Everything fine except is sliding door and mileage. Actual mileage on the city road is 8 to 9km and on highways 11 to 12.5km max. In 5 days driving, I found sliding door closing problem 3 times. So before buying make sure of this. Also in the website of Tata Motors, there is no entry of Tata Venture. I dont know the reason behind it. Is this means if it still under trial run at the cost of all those owners who already bought it. I just love the look and feel of the new Maruti Eeco. It is just stylish and grand too.I just hope it is fuel efficient too and even then who would not want to own a Maruti Eeco. Hope to buy one soon myself. Thanks a lot for sharing. I have maruti eeco, any problem for putting gaskit? And how much milage for putting 1 cylinder. tyres allinment are reqired for how much kilo meter? no problem with lpg fitment, but don’t use domastic cylinder, there will be specific tank for it, and usually in all cars the milage will be 2 -3 kmpl less than petrol. And tyres allinment depends on driving habit and also on road condition. 1. Tata aren’t promoting the Tata Venture much. 2. Small Width- Is it stable at sharp turns. 3. Look as base of ACE- Then why costly. 4. Experience of Mr. D Das-“Actual mileage on the city road is 8 to 9km and on highways 11 to 12.5km max. In 5 days driving, I found sliding door closing problem 3 times”. What should I do . Suggest an option. (Other than Omni or ECO please). I have fallen in love with 1. Interior. 2. Luxury. 3. Safety. of Venture. The Venture is a good option or wait for some more days or maybe months coz the Maruti R3 MPV is going to come. Iam planing to buy venture and i took the test ride on the road and off road guys you will bee astronished to know this car is great even for the person sitting in the back seet and the ac is good and wen you drive this car it will give you a feeling that you are driving a suv . I have planned to buy venture,Advice me about mileage & comfort for hills driving ?. Hardly, see on the road as it is newly introduced car but planning to purchase for personal use / family. Is it suitable car to use in western part of Rajasthan. Please, advise!! yep, you can trust on venture and buy it, though it being a newly introduced car, but is a good return for your money, its my personal experience. @Lijo Mathai…… First of all Thank u very much for such a scientific & detailed study. conclusions made r much helpful.. but with respect to price and other condition… i’ll prefer EECO… for business purpose eeco is really economical… I want to use it in within city only… going to buy in next 2-3 months.. whether eeco is available as school van model.. please help.. thank you so much once again.. Yes brother is there with 5 seater or 7 seators. All the best. Happened to read on the net that the Venture is now available in Bangalore and sales people are claiming it is BS4?? Could you get us the low down-is this the turbo-max from the Indica or the CS4 from the indigo CS?? or is it BS3 sold in Bangalore? Also is top end -~6.5 lakh on road worth it? Hi, I have Maruti Eeco with and i am fully satisfied with it. Even though its milage is city 14/ long 18, but it is like one of our family member. I know Venture is on the competition way production but still love Maruti products. Since Seven months of time we didnot had any service isue in Eeco so far. Its far better than Omni in ways of comfort, style and safty. Kindly give informaiton about venture where the dealer located in mum/thane region. I have already booked Maruti ECCO 5Seater AC. But after looking for teh above comments I bit worried now. I really do not understand how to take a step back on my decision.Actually we are a family of 6 adult and two kids and my budget was below 5 lakhs and have opted for Maruti ECCO. Guide and provide me sincere feedbacks. Having family of 4 adults plus 2 kids with driver making total 7. should I go for Maruti Omni or Eco or Tata Venture or Aria. Understand Maruti Eco 7 seater has no Air condiner? i am planing to buy maruti ecco. i want to know why ecco does not have power steering. is it actually required and why and why not. I have MARUTI ECCO 7 STR for last one year completing 1 st year tomorrow…have droven 10000+ km and am happy with it have been driving with full load 7 persons + luggage…on highways the handeling is excellent ..the strearring does not get heavy..provided u maintain proper air pressure..i have got 14 kmlp in the first trip (200 km) and then have been getting around 10-12 kmpl ….my ecco does not have ac but am planning to install one……..